IF using promo code for CHARITY DONATIONS - Please add "00" at the end of your code (no space). 100% of ticket sales will go to charities. Input the charity code of your choice in "Promo Code" when purchasing tickets. The acronym or single word for the organizations is followed by two zeroes (no spaces as part of the code. Valet Parking at Antonio's Restaurant 2 doors west. 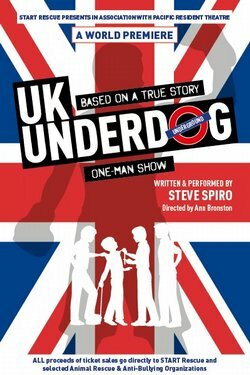 UK UNDERDOG is based on true events in a London, Jewish boy's life. Bullied and humiliated at school, Steve Spiro realizes his strength to move forward, but that ultimately comes at a price. Told with humor and plenty of chutzpah, Steve reveals how the struggles of our past can be a gift to the future and that, no matter what, never give up! All proceeds of ticket sales go directly to START Rescue and selected local animal rescue and anti-bullying organizations. Steve Spiro is the President and co-founder of Shelter Transport Animal Rescue Team (START Rescue) a 501c3 nonprofit. START's focus is on relocating dogs and cats from high-kill shelters in California to partnering rescue groups in the Pacific Northwest and on funding spay/neuter clinics for low-income families.